We make and ship all chocolates out of Newton Grove, NC. Local Delivery is available! We make our own caramel! Special orders are available. Granny Smith apple dipped in caramel and milk chocolate, sprinkled with chopped pecans. Granny Smith apple dipped in caramel and milk chocolate, covered with cashews. 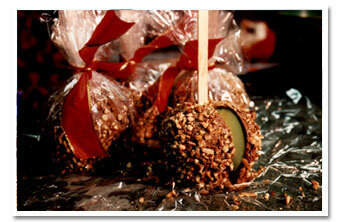 Granny Smith apple dipped in caramel and milk chocolate, covered with crushed homemade butter crunch. Granny Smith apple dipped in caramel and milk chocolate, sprinkled with macadamia nuts, drizzled with dark chocolate.